Our trade show season is in full swing and Chicago we’re coming for you next! We love taking East Coast Chair & Barstool on the road to meet new and current customers in person. Trade shows allow us the opportunity to form a fast connection with our customers. 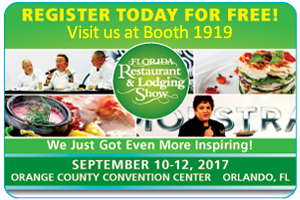 This year’s National Restaurant Association Restaurant, Hotel-Motel Show (NRA) will be no different! The NRA show brings together the movers and shakers of the restaurant industry to Chicago’s McCormick Place for a four-day event that you won’t want to miss. At the NRA show, you will be surrounded by around 45,000 guests and 2,000 different companies exhibiting. Because of the sheer volume of exhibitors, pavilions, and booths, this is a show you will want to take your time. We recommend allotting at least two days just to cover the bulk of the show floor. Any professional in the foodservice or lodging industry is eligible to attend the NRA show, so if you’re in any part of this industry, this is the place to be. Immerse yourself in the newest technologies, experimental cooking, and trends surrounding the restaurant and hospitality industries. 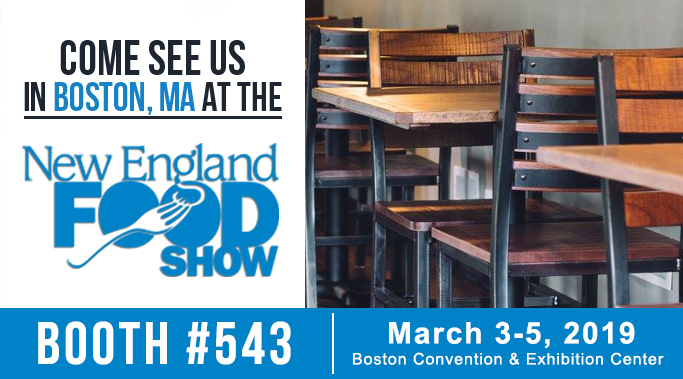 Enjoy education sessions like “Building a Winning Brand”, “Custom Condiments”, and “What’s Really Going on in the Kitchen” to further you and your staff’s knowledge of the challenging restaurant industry. Culinary presentations by Robert Irvine, Duff Goldman, Stephanie Izard, and other celebrity chefs bring gastronomic experiences to life right in front of you. We are ready to hit Chicago with our never-before seen Lake Shore Collection, our newly designed 850 and 925 bucket bar stools, and beautifully handmade Quarter Sawn table tops. If you’re around the Chicago area, make sure to come out May 20-23 for the NRA show. 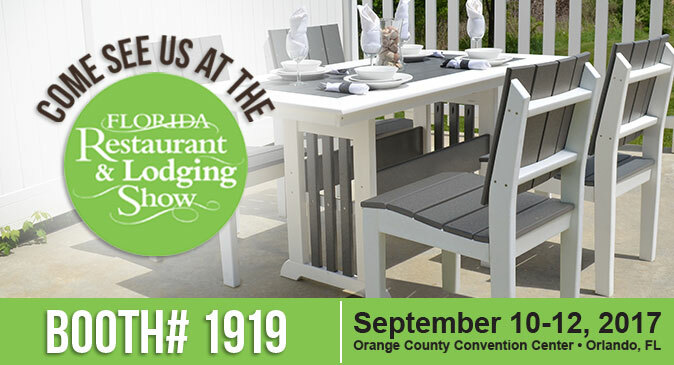 We’d love to meet you and show you what East Coast Chair & Barstool can do for your restaurant. 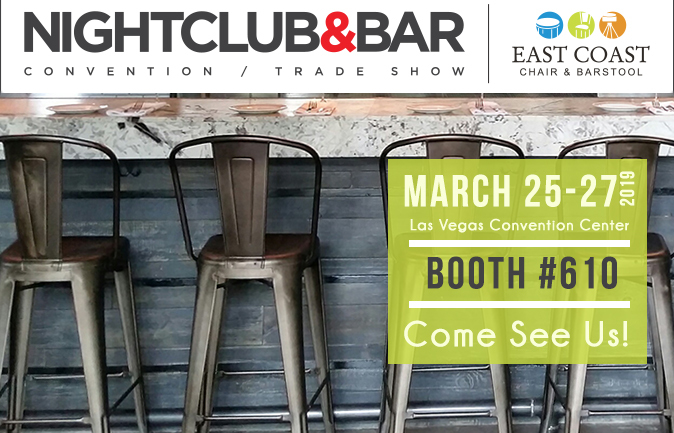 We here at East Coast Chair & Barstool are pleased to report on the 2013 Nightclub & Bar Show (NCB Show) in which we exhibited March 19-21, in Las Vegas. It was our first trade show…ever! The show was quite an experience, and we learned many good lessons, met many good people, and had a little bit of good fun, too. After all, we were in Vegas! The NCB Show kicked off with the first keynote speaker on Tuesday. Founder of Samuel Adams and The Boston Beer Company, Jim Koch, took stage with beer in hand to talk about how brewers and bar owners can hit the ground running. This entrepreneur shared his story of how he grew his company from its beginnings in his kitchen, an original accounting system that depended on shoeboxes, and his vision to recreate how Americans felt about beer. His passion was evident, and he kept the audience engaged with storytelling, photos, and a lot of humor! He talked about his first sale, when he forgot to ask how many cases the bar wanted to order and went on to talk about how his company has grown. Koch also talked about how even though Samuel Adams holds a small percentage of the beer market’s share, they have been successful in changing people’s attitudes about American-brewed beer, especially with the rise in the craft beer market. The biggest takeaway we got from Koch’s speech was that you have to do something memorable, so people start to talk. For instance, they originated the beer dunking tank; a dunking tank filled with beer that had been returned to the company for being stale. By setting up a dunk tank, it showed their customers that they’d rather put people into stale beer than stale beer into people. Even though the word “company” is in his company’s name, he talked about how there are no companies, just people who share common goals. “Do something you love, and that’s the ultimate work-life balance,” said Koch. With social media, everyone is talking about someone, and they might as well be talking about you, right? On the second day of the NCB Show, speaker Nick Shepherd, CEO of T.G.I.Friday’s took the stage for his keynote, titled “Taking a Leap of Faith to Rebrand Your Venue.” This was a great case study of how T.G.I.Friday’s have reinvented themselves through the flair of their customer-focused team members and mixology specialists. The company recently rebranded itself as the best corner bar in town, and Shepherd showed videos of how their local staff across the globe make the difference. It was a positive, warm-and-fuzzy, and fun presentation, and it made us want to eat at T.G.I.Friday’s more often for that “Friday feeling” every day! Following Shepherd’s speech, we rushed to see Nightclub & Bar Media Group’s President Jon Taffer (also from Spike’s Bar Rescue) and superstar CeeLo Green perform the ribbon cutting ceremony to open the exhibit floor. A mad rush of bar and restaurant owners flooded the aisles of alcohol, music, technology, and of course, furniture vendors. During the first day, 20,000 people circulated the show, and booth #319 (where our customer care specialists were working) showed a hustle and bustle all day long! Being a “dot com” (for argument sake, we’re really more than that) which ships to the 48 continental states, we seldom get to meet customers face-to-face, so this opportunity was really meaningful and rewarding to our staff. Getting to know our customers and potential customers on a more personal level will help us serve people better in the future, and it was really enjoyable to make those personal connections with the people who are buying our bar and restaurant furniture. 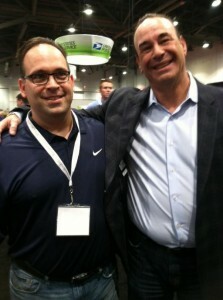 Owner Dave DiSanti meets Bar Rescue's Jon Taffer during the 2013 Nightclub & Bar Show! 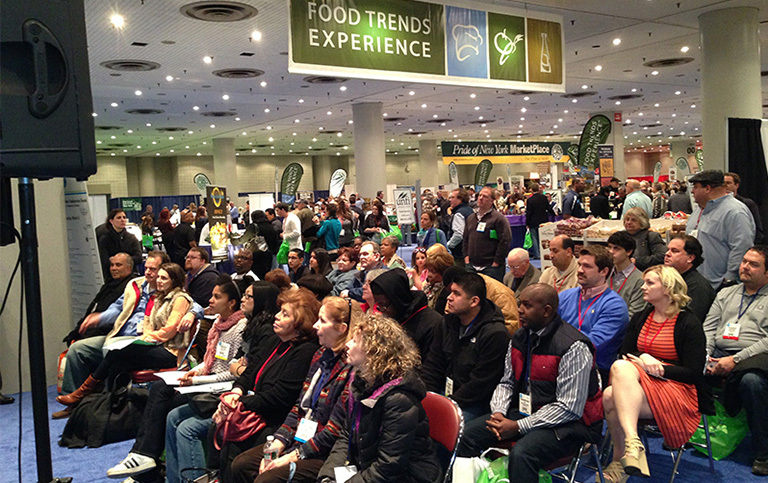 On Thursday, March 21, the closing day of the show, we were all attentive during Jon Taffer’s keynote. We may have been a little star struck when Taffer took the stage – and then jumped off of it. His unconventional style and loud personality kept us engaged (and awake) the entire time. “Fixing a business is easy. Fixing people is tough!” he shouted. He echoed the thoughts of Koch and Shepherd when he spoke about hiring people who will raise the average and become brand ambassadors for your bar or restaurant. He also talked about the product of a bar. It’s not the food. It’s not the cocktails. In hospitality, the product is the emotional reaction that you create. And the people you employ are part of delivering that reaction. Taffer went on to talk about the anatomy of a Bar Rescue, the science of good menu design, and more. He definitely had the crowd on the edges of their seats the entire time. In addition to the keynotes, the three-day Nightclub & Bar Convention & Trade Show was chocked full with in-the-know speakers who all gave killer presentations for the attendees, as well. We learned a lot and came home energized with fresh ideas and new perspectives. When the show closed, we were all exhausted but at the same time, very excited after meeting so many new people and spreading the word about our new products. A big plus, the team left in our Pennsylvania office also had a successful week at home. Overall, it was a wonderful first trade show experience! Were you at the NCB Show? Comment below with your thoughts on the event!